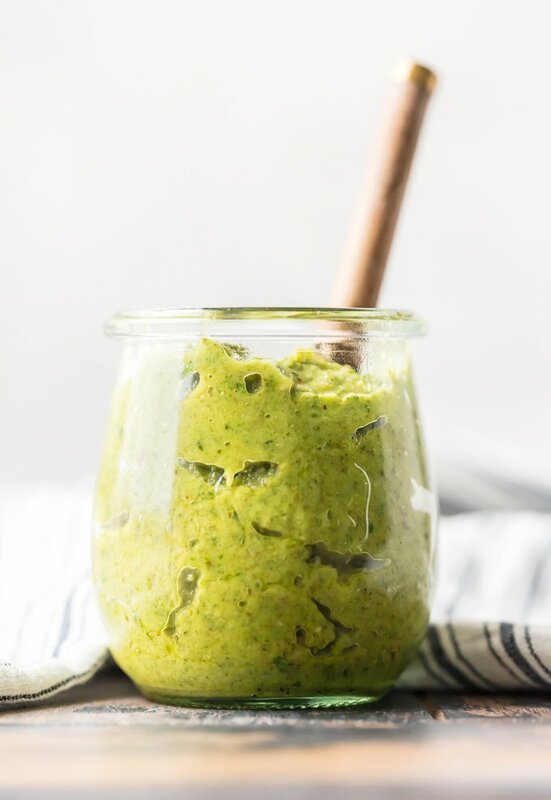 Basil Walnut Pesto is an amazing sauce full of basil, walnuts, olive oil, parmesan cheese, lemon juice, and garlic. This Homemade Pesto Sauce is the perfect topping for salmon, bruschetta, chicken, steak, and more. 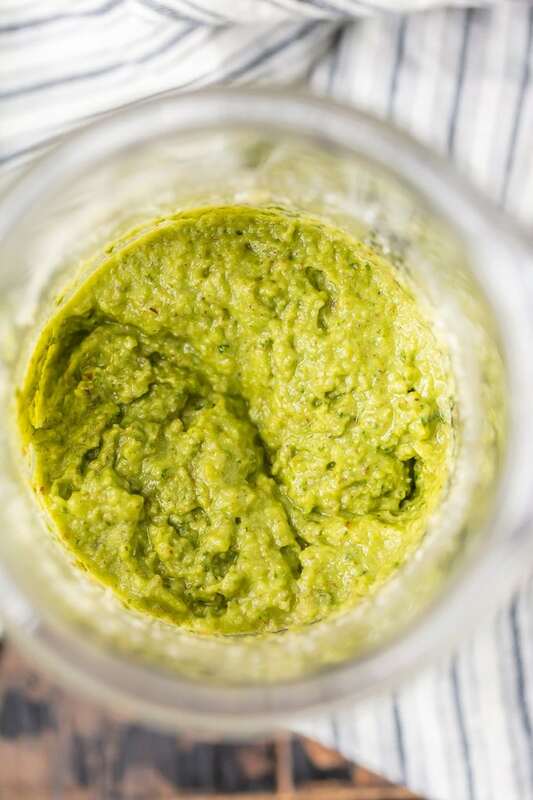 So much flavor and you can quickly make this Basil Pesto Recipe in a blender! This Basil Walnut Pesto recipe is so easy to make. All you need is a few ingredients and a blender! I absolutely love Pesto! 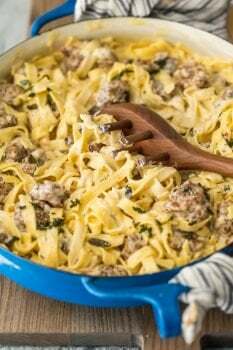 It’s so fragrant and flavorful, and it looks beautiful on top of a nice pasta dish. 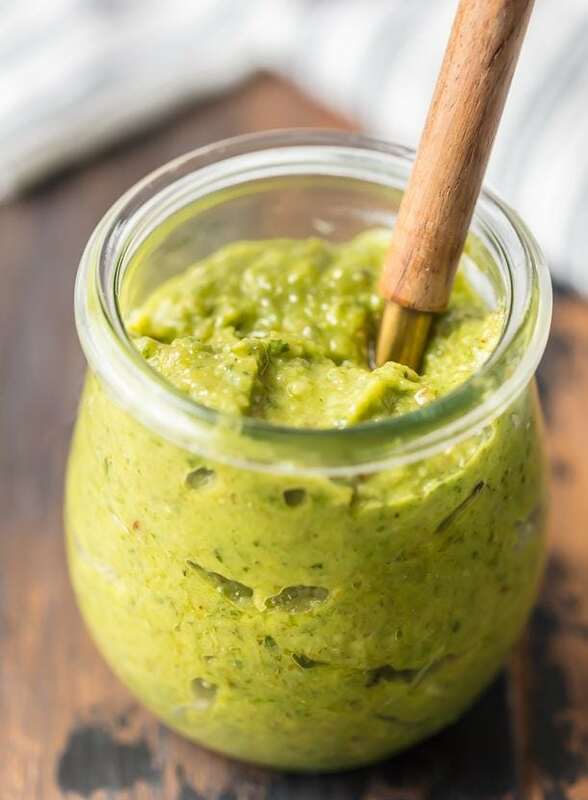 This Basil Walnut Pesto Recipe is my favorite pesto recipe to use around here. I like playing with the flavors and mixing things up a bit, and I think the walnuts in place of pine nuts adds so much to it. 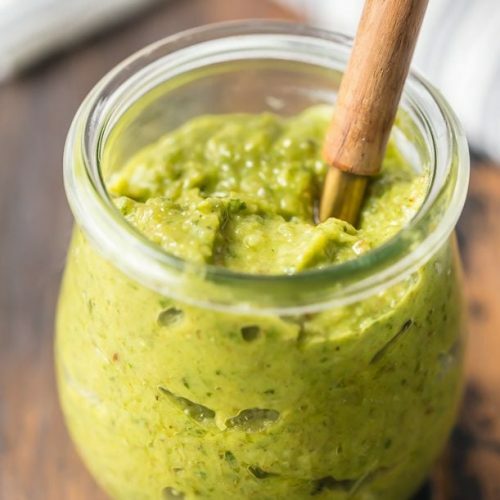 This Homemade Pesto Sauce is so easy to make, there’s no reason to buy pre-made pesto at the store. You can really taste the fresh basil leaves and garlic and it’s pretty drool-worthy. I just love when the scent of fresh basil fills the kitchen while it’s being prepared. Eat this amazing Walnut Basil Pesto Recipe with pasta, fish, or chicken. It goes well with so many dishes! Learn how to make Homemade Pesto Sauce with this Basil Walnut Pesto Recipe! What’s in Pesto Sauce anyways? Just a few simple, delicious ingredients! We switched things up a bit for this Basil Walnut Pesto, using walnuts in place of pine nuts. Pesto sauce is so full of flavor, especially when you make it at home. Plus it’s super easy to make. 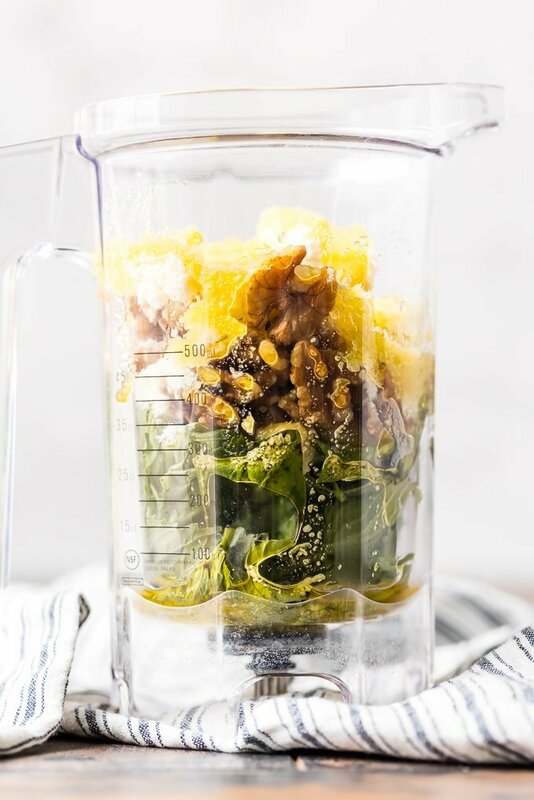 All you need to make this Basil Walnut Pesto is your ingredients and a blender! And done! Now you can use your homemade pesto sauce on all of your pastas, or anything else your heart desires. Can you put walnuts in pesto? Yes! You can put walnuts in pesto. Traditional Pesto is made with basil, garlic, and pine nuts (and a few other ingredients). But you can easily replace the pine nuts with another nut. In this case, we’re making pesto with walnuts. Hence, Basil Walnut Pesto! How long does pesto last in the refrigerator? Homemade Pesto Sauce should be stored in an airtight container to keep it fresh. It will last in the refrigerator for up to a week. But it’s really easy to make a fresh batch whenever you need it. You can also freeze your homemade pesto for about 3 months if you prefer to make a large batch. What can you make with Pesto? This Walnut Basil Pesto Recipe is so delicious and it goes well with so many things. You can eat pesto with pasta, fish, chicken, or any number of dishes. 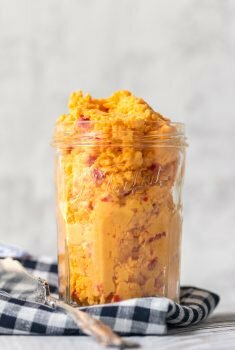 It makes a great topping, sauce, dip, or even a spread on sandwiches. Use just a little or a lot, either way the flavor is just too good. Everyone’s definition of “healthy” seems to be a little different. In my eyes, this Basil Walnut Pesto is a pretty good thing to add to your diet. Basil definitely adds plenty of flavor, but it’s also one of the healthiest herbs. It contains lots of nutrients, like iron, vitamins A and K, and manganese. It’s often used medicinally, so it’s a good idea to add some basil into your foods occasionally. You can read more about the benefits of basil here. While basil pesto sauce is a bit high in calories, it is full of good, healthy fats and lots of nutrients. And since it tastes SO GOOD, don’t feel guilty about adding it into your dishes for extra flavor (and an extra boost of those nutrients). 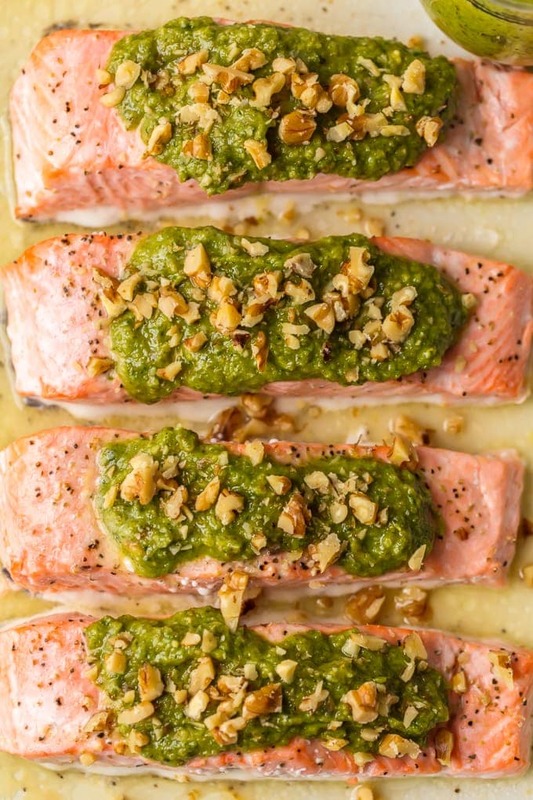 This flavorful Basil Walnut Pesto recipe is too good not to try. 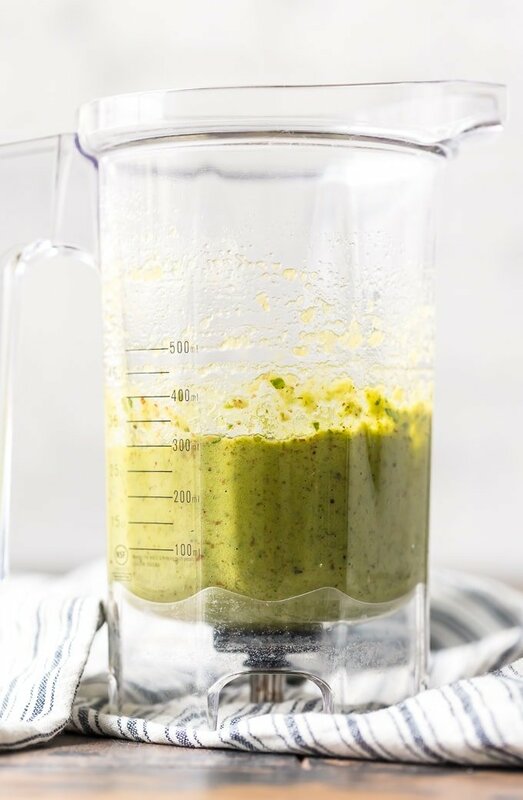 You won’t believe how easy it is to make Homemade Pesto Sauce, and once you do, you’ll want to use it on everything! I hope you love this Walnut Basil Pesto recipe as much as we do! See the recipe card below for details on how to make this Basil Walnut Pesto Recipe. Enjoy! Place all ingredients for the pesto in a high powered blender or food processor. Blend until fully combined and the desired consistency. If it's too thick, add a bit more oil.